he 2019 rally continued for a 6th straight week as the major averages again booked solid gains. Throughout the week, the release of corporate quarterly results continued with three dozen S&P 500 components announcing earnings in just one day this week, the busiest week of earnings season. On Wednesday we had the Fed energize investors when it struck a surprisingly dovish tone on monetary policy. Then before the bell on Friday, we had a stronger-than-expected January jobs report. The other big issue on investor’s minds is trade. Market observers were watching developments between the U.S. and China as officials there attempted to forge the framework toward a resolution of tariff disputes in the final day of this round of negotiations. For the month the Dow rose +7.2%. This past week the blue-chips broke through 2 more areas of resistance with a break above a downward trendline and also a close above the 200-day moving average. The Nasdaq Composite has also closed higher for six straight weeks as it recovered from its first decline of more than -20% since 2011. It booked its best January since 2001 with a +9.2% monthly gain. The S&P 500 index posted its best January since 1987. For the month, the bellwether climbed +7.9%. 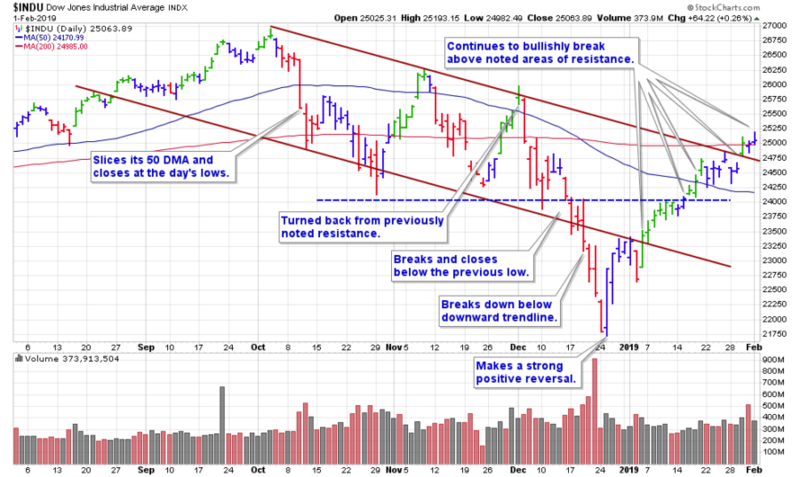 There were several bullish factors to this past week’s rally including the fact that we had 6 breakouts from last week’s watch list of 12 stocks. 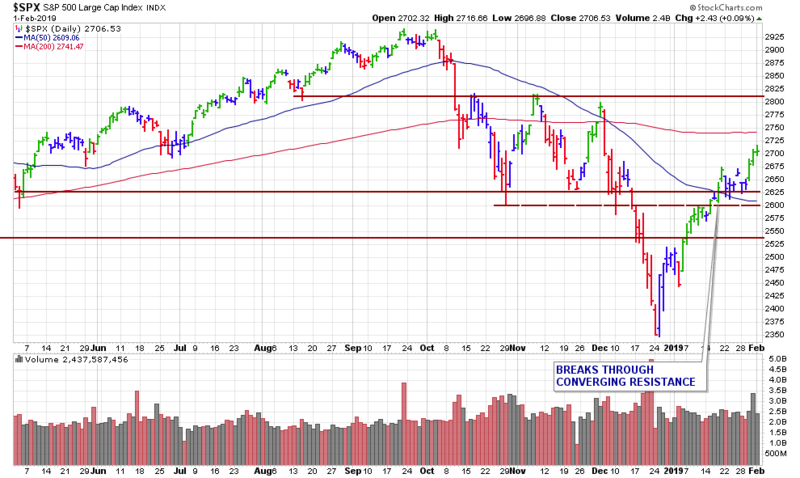 The distribution day count remains low with still only 1 on the S&P 500 and just one on the Nasdaq. 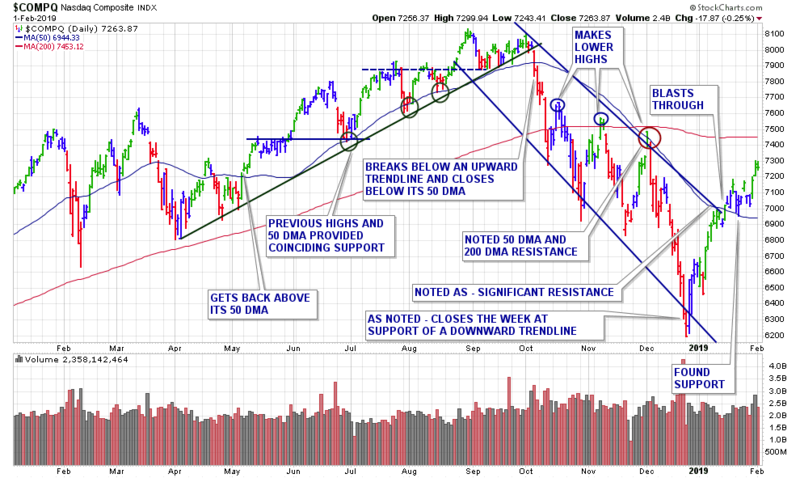 Currently, the market continues in a confirmed uptrend. This Week’s BreakOuts From Our….